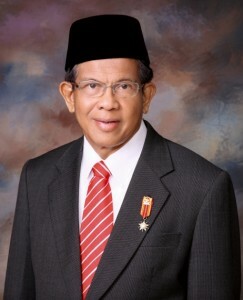 Andi M. Fatwa is an Indonesian retired military officer and a Muslim preacher. He was a member of “Petition 50”, a coalition formed in 1980 by 50 influential retired military personnel, elder statesmen, and religious leaders; all critics of the Suharto regime. Fatwa combined religious teaching with political activism. In an interview with Ed Quiko, Fatwa recalled how his political activism began in his youth. According to Fatwa, “In 1955 at the age of 15, I was not eligible to vote, but I campaigned for the late religious leader and politician, Abdurrahman Shihab. Shibab was a prominent Masyumi political party leader that I will never forget.” Coincidentally, Shibab was the father of Dr. Alwi Shibab, a FAC member of the Fetzer Institute. Tragically, at the age of 54, Fatwa was arrested in 1985 with other political activists and sentenced to 18 years imprisonment for subversion. After 12 years of incarceration Fatwa was released from prison in 1993. Prior to Fatwa’s release, he was obliged to write a paper to express his views on the state of the ideology of Pancasila. The military had decided that all political prisoners convicted for subversion would be required to submit their views on Pancasila and the Constitution as a condition of their release. Amnesty International, however, regarded this requirement as a violation of international human rights standards upholding the rights to freedom of expression and opinions. Fatwa maintained that love and forgiveness is important in government, a concept that he picked from political leaders who shared the same view. He cited examples of leaders that have practiced love and forgiveness in governance that included, Kasna Singodinggejo, whom he worked with as a secretary. He said that Kasna was a freedom fighter imprisoned by Soeharto’s predecessor, former President Soekarno. But when Soekarno died, Kasna escorted the deceased to the cemetery in Blitar. Fatwa also recalled the case of Syahrir, a political antagonist of Soekarno during the revolution against the Dutch. Syahrir was imprisoned by Soekarno and later died in Switzerland. However, upon his death, Soekarno granted Syahrir recognition as a revolutionary war hero. Fatwa also added that towards the end of the Soeharto regime, he applied the concept of forgiveness by granting medal honors to his political foes. A. M. Fatwa is an exemplar of love and forgiveness in governance.